Planning for Spring break or upcoming summer travels? RoutePerfect might just be your new best friend! Planning and booking for ideal trips anywhere in Europe is easy thanks to their interactive and user-friendly website. ​The site already counts over 2 million users and is built like a one stop shop, harnessing strong technology and fun user experience to allow you to become your own travel agent. Wondering how to plan and book the perfect trip or what to do in the most popular European destinations? Pondering what to pack for a long-trip / a weekend trip or the best European destinations for a honeymoon? RoutePerfect might be able to lend a helping hand with your travel plans. Boaz Lantsman and his team launched RoutePerfect in 2013 to allow fellow avid travelers to easily plan and book multi-city trips anywhere in Europe. All you need to do is enter on the website is where you want your trip to start and end. The platform then generates a customized itinerary specifically for you. The site will also suggest destinations and packages for each type of vacations to make the process as personalized as possible. If you’re feeling adventurous or just aren’t sure where to go, you can also let the website suggest destinations for you to add to your itinerary. RoutePerfect also gives you the opportunity to customize your trip even further. You can easily add or remove a destination to your itinerary based on personal preferences. Once you’re satisfied with your itinerary, all you need to do is to choose a hotel from the list of options in your budget and book the whole trip as a package so you can save up to 20% on your trip as opposed to booking each destination and hotel separately. There are also suggestions for top itineraries if you have some flexibility with your stops within a specific destination. And a handy transportation tool is available to give you an idea of travel within the region. 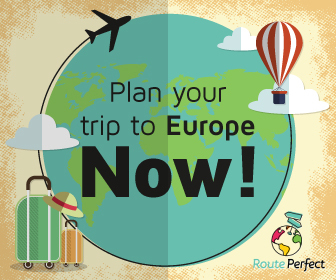 So if you are Europe bound, then RoutePerfect is a new travel friendly website to consider for help with your plans.